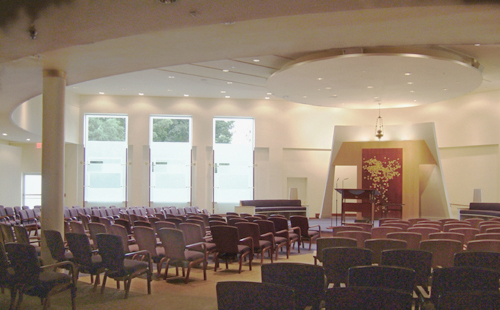 The sanctuary renovation at Temple Shalom. The new sanctuary is accessible and light-filled. Flexible seating in a semi-circle supports the congregation’s sense of community and encourages full participation in services. 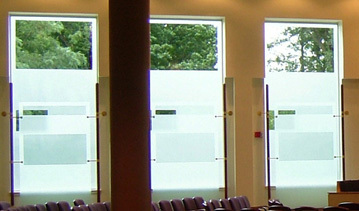 Frosted glass screens suffuse the sanctuary with light while keeping direct sunlight from hitting congregants. They allow views of the sky and trees while blocking undesirable distractions, like the parking lot. The old sanctuary was three steps below the lobby, had no natural light, and a steeply stepped bimah.